The goal of this session is networking and knowledge exchange between participants. Each group will present the clinical case(s) as good clinical practices of personalized medicine. The presentation of the “intersection” of different diagnostic data (clinical symptoms, genetic, serum/blood analyses, UZ, CT, MRI- images , tissue examinations, functional tests, etc.) are encouraged. Participants will be divided in 8 groups with a limited number of seats (see list of topic below). At pre-registration procedure each participant will choose one topic from the list of Group work topics. Selection will based on first registered participants for each topic (see list below). On Sept. 26, in the afternoon (3 hours), each groups will have to prepare a 15 min presentation under the supervision of the tutor (professor) and (potentially with) co-tutor. Each tutor is invited to suggest 3 to 4 key (review) papers including: case description, epidemiology, molecular basis, personalized Dgx and Thx with ethical and economical consideration of the selected topic. 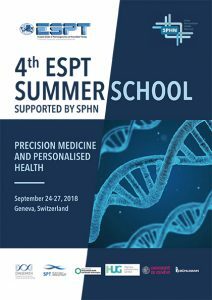 Each presentation should consist of 10-12 slides with figures and tables for 15 minutes oral presentation including epidemiology, molecular basis, personalized diagnostics and personalized therapy with economical and ethical considerations of the selected topic. Presentations (8 x 15 min) will be scheduled on Sept. 27 in the afternoon. All presentations will be evaluated by scientific board and the best presentation will be awarded.